The Kokino observatory represents an epochal discovery from the bronze ages and it's authentic is already confirmed by mathematical, physical and astronomical ratings. On this built 38 centuries ago, with unbelievable precisely ratings and researches were the movements and the positions of the celestial objects. In October, 2002 near the village Kokino by Kumanovo, in the region of Taticev Kamen was discovered the only megalithic observatory in the Balkans, which by it's value is only one, even in the world. It was discovered by the archeologist, Jovica Stankovski from Kumanovo, who first noticed the two thrones in the center of this location. Helped by an astro-physist Gjore Cenev, it was confirmed that that it's different than the others archeological locations, which Macedonia has thousands. Soon they compared it to the well known English Stonehenge. - "In Taticev Kamen we discovered the Macedonian Stonehenge", said Jovica Stankovski. It was an object that served to a several researches of the Sun and the Moon, built on a Vulcan rocks, on a peak high 1,013 meters above the sea level. It was confirmed that this location is from 1815 BC. But it cannot be mentioned that the astronomy existed 38 centuries ago, back in 1815 BC, when the people didn't even make difference between the science and the religion. 38 centuries ago, on this place the civilization existed, 1,500 years before Alexander the Great, and that is confirmed by the arthefacts discovered in it's surroundings (bases of houses, ceramic stuff, knives, axes). Kokino from the entire 100, it was rated by 80 points. The Kokino observatory has characteristics that made it unique in the world and represents strong competition of the ancient observatories in Scotland, Ireland, but also a strong competition for the well known observatory in the world, the English Stonehenge, which is discovered from the beginning of the 12th century and it's rated by 80 and Kokino since it's discovering started with 80 points. 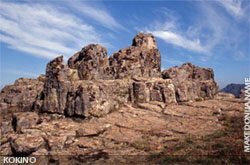 It is possible the start of building Kokino was 4,000 years ago.